It is a proven fact that over 50% of projects fail without proper project management. With the complexity of recent systems steadily increasing, a project manager becomes critical in order to have a centralized effort to effectively coordinate all facets of the project. The project management aspect of the project is often overlooked and typically results in a poorly designed, inefficiently implemented systems that are usually more costly and less effective and dependable as they should be. During all facets of the project; design, implementation and support; Advanced Automated Controls, Inc. provides our customers with professional, dependable and responsive project management services. Our project managers are involved from conception to implementation and support to assure all facets of the project are coordinated and implemented in a professional and timely manner. This service is a must in today's industry of ever changing technology, typically utilizing multi-vendor hardware and software solutions. AAC, Inc.'s project management skills will address technical necessities, along with the scheduling and coordination of all people and resources needed for an efficient project coordination and implementation. 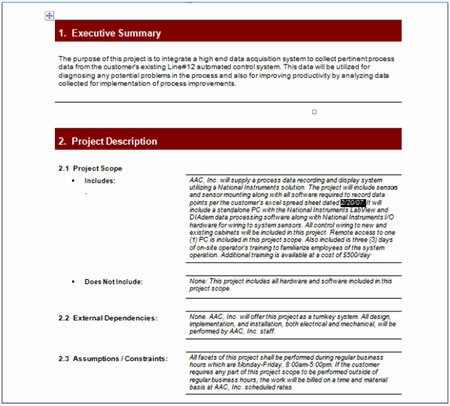 While AAAC, Inc.'s project managers will manage your project from conception to implementation and support, we believe keeping our customer's informed of the ongoing status is critical. Frequent meetings between all parties involved throughout all facets of the project , especially during critical phases are vital to a seamless project implementation. At AAC, Inc. also offers a web based project management tool that is updated daily to keep all activity of the project in a central location allowing access via a secured web portal. This allows all parties to enter the secured web environment to get project status updates, make comments or suggestions, or update critical information egarding the project. This gives 24/7 access of all pertinent information to all parties involved. At AAC, Inc., extensive time is spent developing a thorough project scope to assure the customer's expectations are met or exceeded. This key element is essential for all parties to assure all expectations of the project at hand are understood and met. Our project scopes are reviewed with all parties involved, from plant managers to machine operators to assure all project expectations are met. Once a comprehensive design and scope is developed, AAC then requires a kickoff meeting of all resources involved to review what is expected of all parties involved. At this point, concept designs, project scopes, timelines, and as built drawings are reviewed with so that all parties involve understand what is expected of them. This along with proper project management assures an effective and efficient implementation of the project at hand with the upmost professionalism in the industry. Our engineers are some of the best in the industry. Extensive training is performed to keep our personnel up to date with the latest technological advances in the industry. All are factory trained and certified for all major OEMs in the industry including Rockwell Automation, Siemens, ABB, and GE Fanuc to name a few. Most of our engineers have spent time in the manufacture, OEM, vendor, and consultant arenas to give them a well-rounded background on understanding our customers' needs…. Just another facet that assures a safe and efficient project implementation. During the project implementation phase, all projects implemented by At Advanced Automated Controls, Inc. go through Factory Acceptance Testing (FAT) to thoroughly test and verify the system prior to implementation at the customer sites. We perform a Pre-Start-Up Inspection (PSI) on all systems to assure all wiring and interfacing is correct. All software is loaded, and hardware and communication media are configured in order to fully test all facets of the system prior to installation at our customer's site. This minimizes downtime at the customer site and assures a safe and efficient startup and commissioning of the system. We are there when you need us! In the continuous processes of today’s 24/7 manufacturing environments downtime is widely accepted as an inevitable part of the process. Our goal is to keep downtime at a minimum. Modern control systems have improved process quality, efficiency, and uptime, but the complexity of these control systems has also greatly increased. Because of this, AAC, Inc. offers onsite support 24 hours a day 365 days a year to our customers to assure your systems stay up and running. In addition to traditional call-in based support, we also offer support contracts which allow our customers to purchase a block of hours and benefit from reduced engineering rates and a guaranteed 24 hour response. We stand by our system and assure our customers that we are there to support you for the complete life cycle of your system. All projects performed by AAC, Inc. will have a guarantee of customer satisfaction as we are confident in our work and project management skills. These skills not only allow for an efficient and precise project implementation, but also assures that the most cost effective and accurate solution is utilized, minimizing typical shortcomings such as re-engineering and engineering misses. We know that by carefully positioning our solutions in the mainstream of technological development, we endeavor to protect our customer's investments long after project implementation.